0 Comments Published by KL Ocs Kid on Monday, May 28, 2007 at 2:50 PM. Liverpool chief executive Rick Parry has played down reports that manager Rafael Benitez is unhappy with the progress made over new signings. Parry insists American owners Tom Hicks and George Gillett will provide Benitez with money for transfers. "They think Rafa is the right man for the job, they think he's a fantastic coach and they want to provide him with the backing," he told BBC Five Live. "The position is to focus on getting things done and stop the speculation." The Reds reached this season's Champions League final, where they lost to AC Milan, but again fell short in the league, finishing the season 21 points behind champions United. It is now 17 years since Liverpool last won the domestic title. "The commitment of the owners is absolutely clear," added Parry. "They are going to provide backing and have made that clear to Rafa and we will be moving forward very positively." However, Gillett is not convinced the Premiership crown is a realistic target next season. "I don't know if we are capable of challenging for the title next year," stated the American. "We want to make progress but it is a multiple-year programme. We want to challenge but we won't do it overnight. "Manchester United are formidable competitors, Arsenal are one year older, with brilliant young players, and Chelsea are not going to get any worse. 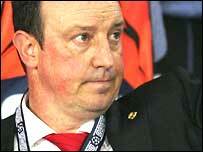 "Next season is up to Rafa Benitez and our chief executive Rick Parry. "They have a plan and we're working on it. We're right behind it but we've got a big job to do." Meanwhile, Parry hopes Uefa make positive strides in assessing and reacting to the crowd chaos at the Champions League final in Athens. Thousands of Liverpool fans failed to get into the ground, despite having tickets, and riot police used tear gas and batons outside the Olympic Stadium to quell disturbances as supporters were turned away. Uefa spokesman William Gaillard has suggested future finals could be rotated around stadiums with a capacity of at least 70,000 and Parry would back such a plan. "It has got to be a good idea to stage finals in stadiums that are up to the task," said Parry. "To have a stadium with no counting systems and no turnstiles in this day and age is simply unforgivable for any standard of game, let alone a major final. "We produced a report for Uefa the week before predicting, sadly, all of the things that actually did go wrong. "We told Uefa our intelligence suggested there were 5,000 forged tickets in existence. "They knew and we knew that thousands would travel without tickets and stressed the need for a proper check at the outer cordon. "We don't condone the behaviour of Liverpool fans who charged gates, who stole tickets or knowingly had forgeries but, at the same time, we are hugely concerned that many innocent fans with valid tickets did not get in. "There was real breakdown in procedures by any analysis and the checks at the outer cordon clearly didn't work. "Short of having 40,000 tickets you are always going to have disappointed people. "But 17,000 was nowhere near enough. We have seen the numbers in Dortmund for the Uefa Cup final in 2001 and Istanbul for the Champions League final two years ago and it was clear there was going to be the same or even a greater demand in Athens."